Turn on lights, adjust the thermostat, and control all of the products that you use in your home—even when you’re not there. And you can do it all by asking Siri. Make sure that you have HomeKit accessories set up in the Home app. Check that your iOS device, Apple Watch, or HomePod is connected to a Wi-Fi or cellular network. 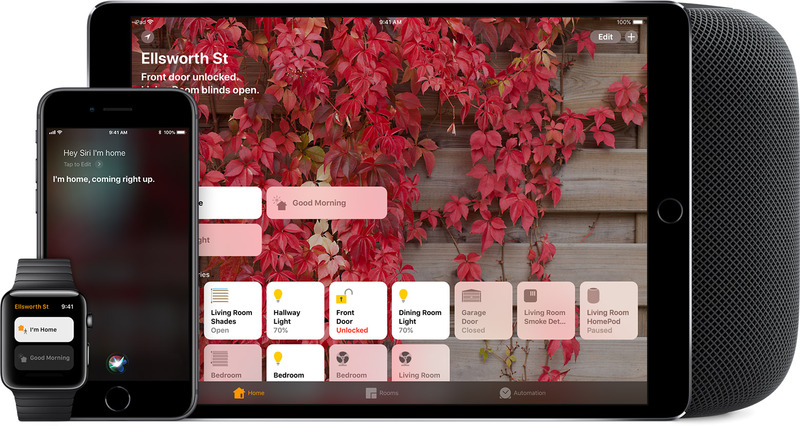 To use “Hey Siri” to control your HomeKit accessories hands-free, you need an iPhone or iPad* with the latest version of iOS, Apple Watch with the latest version of watchOS, or HomePod. You can also use Siri on Apple TV 4K or Apple TV (4th generation) to control your home by holding down the Siri button on your Siri Remote. *Not all iOS devices support using “Hey Siri” hands-free. Learn which iOS devices support this feature. Siri availability varies by country, region, and language. Learn which Siri features are supported in which countries and regions. Siri knows which HomeKit accessories are set up in the Home app as well as their status. Siri identifies your accessories by their names, location, and other details that you’ve added to them in the Home app. And if you set up a HomePod, Apple TV, or iPad as a home hub, you can use Siri to control your home from just about anywhere. “Turn on the light switch. *When you lock your device, some accessories can’t be controlled using Siri. For example, you need to unlock your device before you can use Siri to unlock your door.